Can anyone access your bank-account linked with lost Aadhaar card? In case you have lost your Aadhaar card, you might be worried about its potential misuse. It might perhaps occur to you that fraudsters would access your bank account linked with your lost/misplaced Aadhaar. Can fraudsters access your bank-account linked with lost Aadhaar card? Is misuse of bank account via lost Aadhaar, possible? According to UIDAI, when you link your Aadhaar with your bank account, the bank only sends your name, biometrics, Aadhaar credentials, etc. to the UIDAI, and not your bank details. "Just like by merely knowing your bank account number, one cannot withdraw money from your account, similarly by merely knowing your Aadhaar-number, no one can withdraw money from Aadhaar linked bank account," states UIDAI. For security reasons, one cannot withdraw money from an Aadhaar-linked bank account without verifying necessary bank and Aadhaar details. For making any transaction, your fingerprint, or Iris scan, or an OTP sent to Aadhaar-registered mobile number would be required, at the very least. "No Aadhaar-holder has suffered any financial or identity theft on account of any misuse or attempted impersonation of Aadhaar," assures UIDAI. Is it even mandatory to link Aadhaar with bank account? 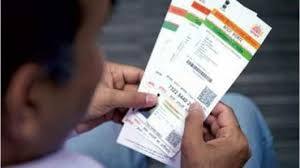 Post the September 26 Supreme Court verdict relating to authentication of Aadhaar, there has been much confusion with respect to services where Aadhaar is necessary and where not. To clarify, Aadhaar is no longer mandatory for services such as bank account, telecom services, and school admissions/entrance tests. However, it is still necessary for getting a PAN, filing I-T returns, and availing government welfare schemes.